A body is found in the woods of a small town on the outskirts of the University grounds. Molly, a rookie reporter who is rebuilding her life after losing a child, is assigned the case for the local newspaper. Many secrets are kept behind white picket fences and Molly prays that as she digs, the secrets do not reach too close to home. The book opens with the grisly discovery of a body near the Eastern Creek bridge. You can feel the chill of the icey cold waters and ominous grey skies in Kimberley’s words as Molly takes an early morning drive out to the creek after a tip off from her boss. The nervous reporter witnesses the crime scene unfold as news trickles through that the body is that of an infant baby girl. Very quickly the locals are pegged out and they all have their own secrets. I found myself carrying my own suspicions about each one of them as each flaw and concealment was revealed. The plot of this book is so carefully constructed that the twists and turns lead you one way, only to flip the page and have your eye on someone else for the crime. There are three other plot lines running simultaneously throughout the book, which connect to each other and intertwine with the main investigation seamlessly. I’m the annoying person in the cinema who alway guesses the twist before the end of the film, but this book had me stumped until the end. 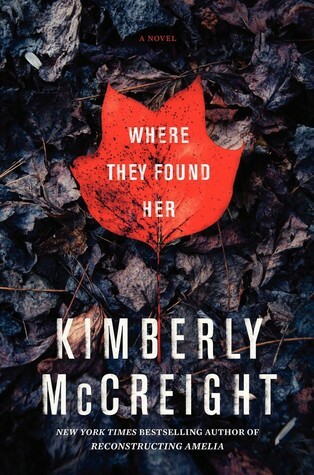 One of the most suspenseful, thrilling books I have read in 2015 and I will be putting Reconstructing Amelia, Kimberley’s first read, on my TBR pile. Every thriller I have read recently seems to get darker, sharper and each brings more surprising twists and turns. If you love suspense and domestic thrillers then this needs to be the next book you read. Sign into Goodreads to see if any of your friends have read Where They Found Her.